You left a few awesome habits behind when you grew up: Wearing dinosaur costumes, attending sleepovers, and maybe most importantly, blowing bubbles. So for this week's Shooting Challenge, photograph bubbles. Floating soap bubbles, photographed correctly, and be a gorgeous, impossible swirl of colors. To capture them, you'll need to use a lot of light (morning sunlight or studio lights are best), and using a dark backdrop will help them pop. This tutorial is excellent. For those who prefer video, watch this short clip. But honestly, bubbles are a striking enough subject that there's really no wrong way to photograph them. Our lead image, by JD Hancock, is of a bubble at close range. It's actually blurry—probably because the shutter speed wasn't fast enough to capture the bubble still. More light would have helped. But that technical mishap is an artistic plus, creating an ephemeral quality to the shot. 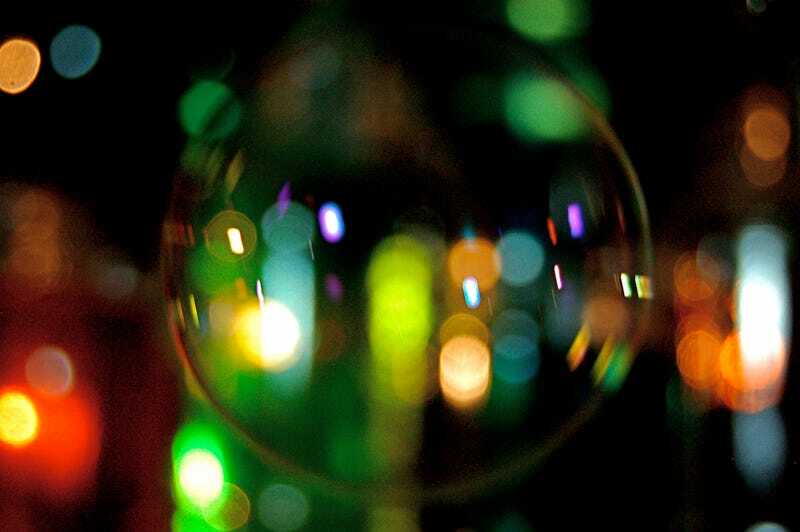 Send your best photo by Monday, March 2nd at 10 AM Eastern to contests@gizmodo.com with "Bubble" in the subject line. Save your files as JPGs, and use a FirstnameLastnameBubble.jpg (970px wide) and FirstnameLastnameBubbleWallpaper.jpg (2560px wide) naming conventions.